Applications must be RECEIVED no later than March 18, 2019 (if an application is received after due date, the application will be denied). 1. A copy of the most recent Audited Financial Statement. If there is not an Audited Financial Statement, please explain and attach a copy of the most recent 990. Please note, if you have the 990 postcard, attach a copy of the postcard and a completed Fiscal Year Financial Statement. 2. A list of the names, titles, and city or town of residence for the board of directors, chief executive officer, and any other key personnel or volunteers involved in the project. IF AN APPLICATION IS MISSING ANY REQUESTED INFORMATION, THE APPLICATION WILL AUTOMATICALLY BE DENIED. Application is fully complete and legible. 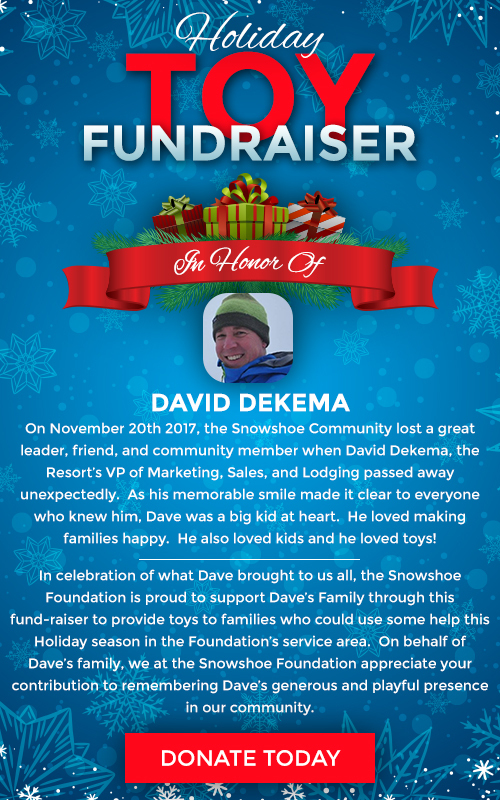 The purpose of the project is explained and falls within the scope and priorities set forth for the Snowshoe Foundation. The goals and objectives are clear with measurable outcomes. The budget is adequate to support the project and sufficient justification is given for the amount requested. We will consider funding additional types of programs that align with our mandate. Grants are intended to be used for purchases of goods and services such as construction, repairs, equipment, supplies, and programs. Funding for salaries is not provided. With your support, we are able to help develop healthier communities and instill hope in the hearts of area residents. As part of our obligation to exercise due diligence with respect to the distribution of donated funds in the form of grants, and to maintain compliance with legal requirements, please understand that the Snowshoe Foundation may seek information from a variety of sources regarding your organization and individuals involved in your organization. Quarterly reports must be made to the Snowshoe Foundation as you use the grant award money. The quarterly report form will be provided to you by the Foundation. To preserve your eligibility to receive future funding from the Snowshoe Foundation it is mandatory that you recognize and publicize Snowshoe Foundation’s support of your project. In your final quarterly report, include any articles, programs, pictures, media releases, signs, newsletters, etc. 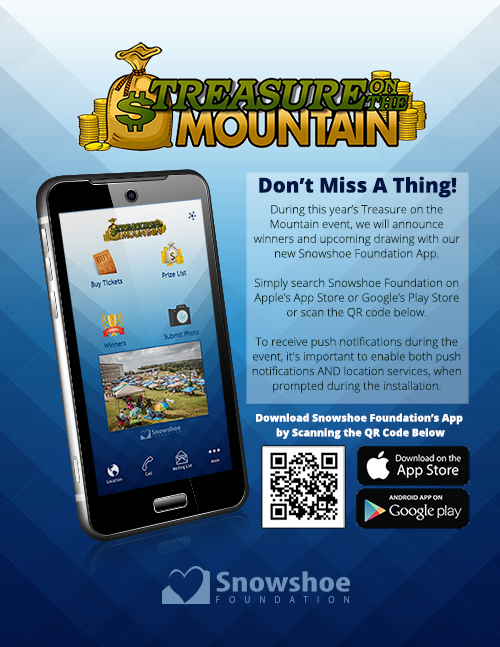 which specifically mention Snowshoe Foundation’s involvement with your project. Since 2002, the Snowshoe Foundation has contributed over $2,000,000.00 to support family and community development efforts. Through the philanthropic efforts of many compassionate residents and businesses, we are able to promote stewardship and growth of our beloved mountain communities. Grant recipients are named at our annual Winter Benefit Dinner. If you are interested in supporting our grant program, please consider participating in one of the five main fundraisers that we hold during the year. We also accept direct donations.